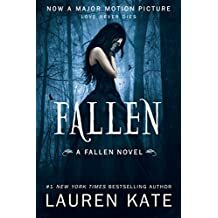 I recently finished reading the first book in the Fallen series and I thought it was pretty good. I really liked the pacing of the book, it did start off a little slow at first but the more I read the more I wanted to see what would happen next. I thought the characters were well thought out and added a lot of diversity to the story. I found Luce, the main character, to be intriguing and I couldn’t help but feel sorry for what she had to go through as she trudged through life wondering why a certain event happened, which ultimately led her to Sword and Cross. The school is for troubled kids who all have a tainted past. It is there that she meets Daniel for the first time, a hot jerk whom she can’t get out of her mind. As the story continues to unfold I began to understand Luce and Daniels’s relationship and being that this is a series I’m sure I’ll learn more about their tumultuous love story. This entry was posted in YA and tagged books, review. Bookmark the permalink.